Today I’m going to demonstrate how to make a beautiful Thanksgiving Cornucopia cake topper! Today was my first try at creating a cornucopia cake topper, but it came together surprisingly quickly! 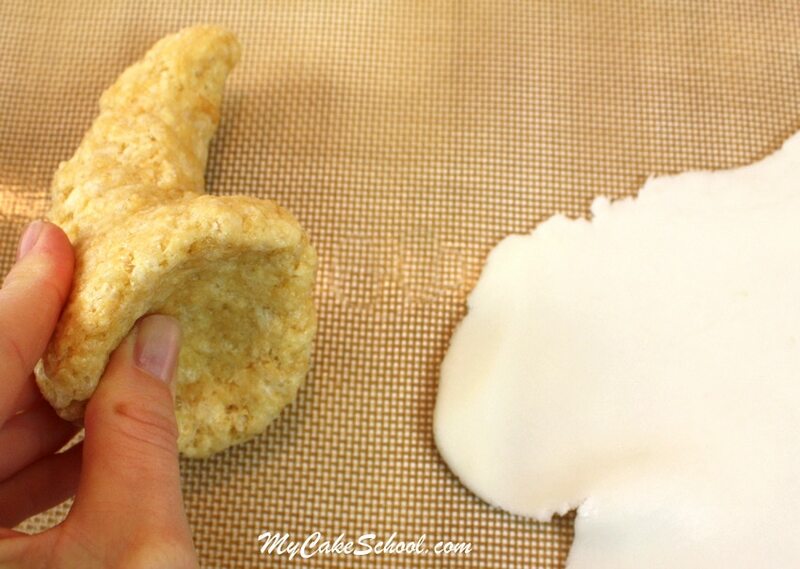 With rice cereal treats on our side, anything is possible! This will not only make a great cake topper, but for all of the cookie or cupcake fans out there, it would also make a great centerpiece for the middle of your dessert platter. 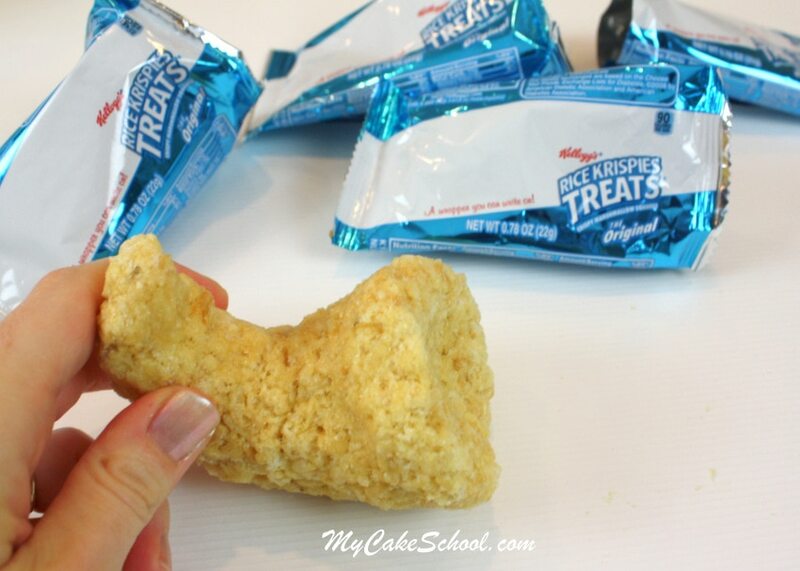 First, I mashed and shaped four Rice Krispies Treats (22g) together into the shape of a cornucopia. Next, I rubbed a light coating of vegetable shortening onto my cereal treat cornucopia before covering it with a layer of fondant. I trimmed away the excess with a pizza wheel. Next, it was time to paint! I painted the cornucopia with Americolor Chocolate Brown, which was diluted a bit with vodka. Mixing vodka (or even lemon extract) with coloring gel is really helpful when painting because the alcohol greatly speeds up the dry time. 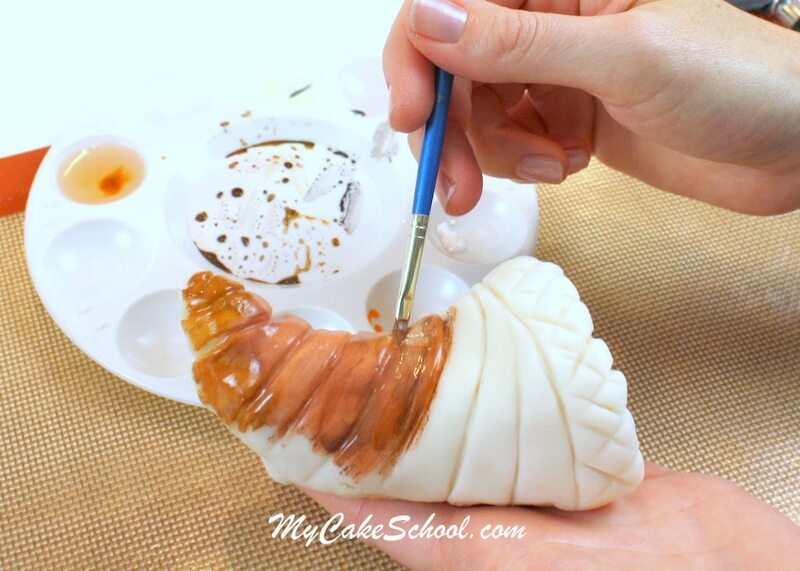 If you’d prefer not to paint, you can tint your fondant brown with coloring gel from the beginning. 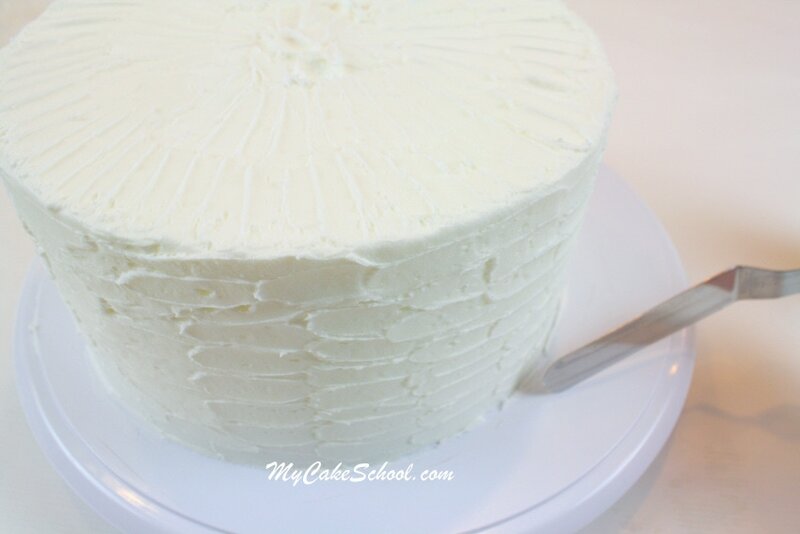 Here’s our cake of honor, an 8″ cake which is frosted with our Classic Vanilla Buttercream Recipe. I used my small offset spatula to give it a little texture. Here you can see that I pushed a bubble tea straw (cut to the height of the cake) into the center. This is an optional step, but it’s not a bad idea to add a support beneath your cake toppers to prevent any chance of sinking. Next, I rolled out a bit of fondant (tinted Americolor Chocolate Brown), and used my 2D piping tip to cut out circles. Using a Stone Stamp Set (aff. ), which can be found online and often at craft stores (like Michael’s, etc.). 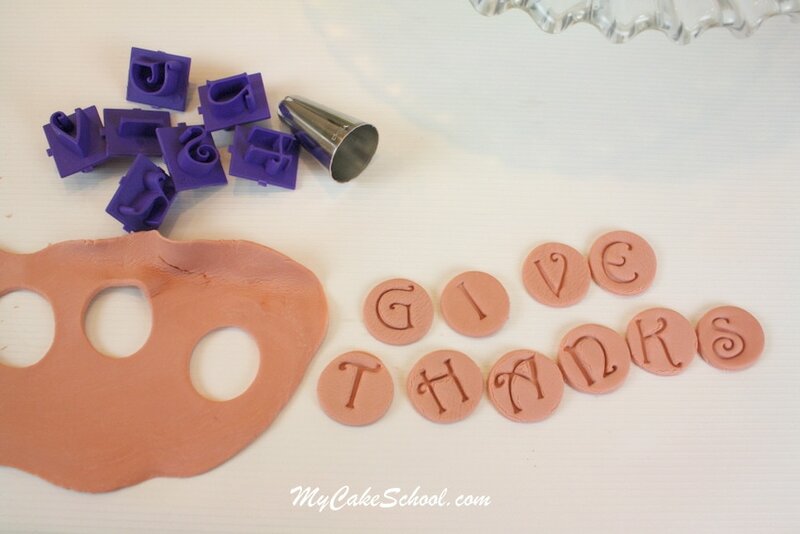 I embossed the fondant circles to spell our Thanksgiving message. I used a little of my vodka/coloring gel paint to darken the letters so that they would pop out a little more, but that is optional! 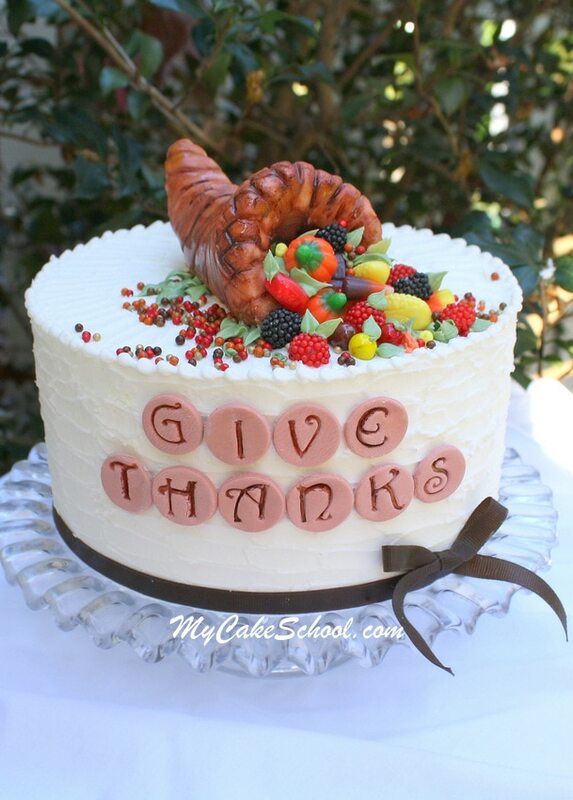 I placed the cornucopia onto our cake and filled it with assorted candy–you have some flexibility with this step. Use whatever you’d like. I went to our local candy store and bought a little bit of everything…(gummi raspberries, Sixlets, Indian Corn, and candy pumpkins). I filled in with fall colored sprinkles and buttercream leaves (tinted Americolor Avacado Green and piped with a leaf tip 352). This is such a beautiful cake!! Thank you so much for the instructions!! I always wanted to make a cornucopia for a cake and you made it look so easy. You really are so so talented and real artistic! Very nice. Love all the beautiful Autumn colours. This is beautiful and I am actually planning on making this next week! I have one question… did you put anything underneath the vegetables and fruit to make the cascade out of the cornucopia? Or is it just more candy? Thanks! Melissa…..Simply adorable. Too pretty to eat! I wish you and Bebe and your family a warm and happy Turkey Day. Gorgeous cake … pinned it! Lovely addition to a family Thanksgiving! Let us give thanks for we are so blessed! Happy Thanksgiving Melissa to you and your family! hi…thanks for your lovely tutorials that make our lives a bit easier! This is a wonderful tutorial, thank you so much!!! 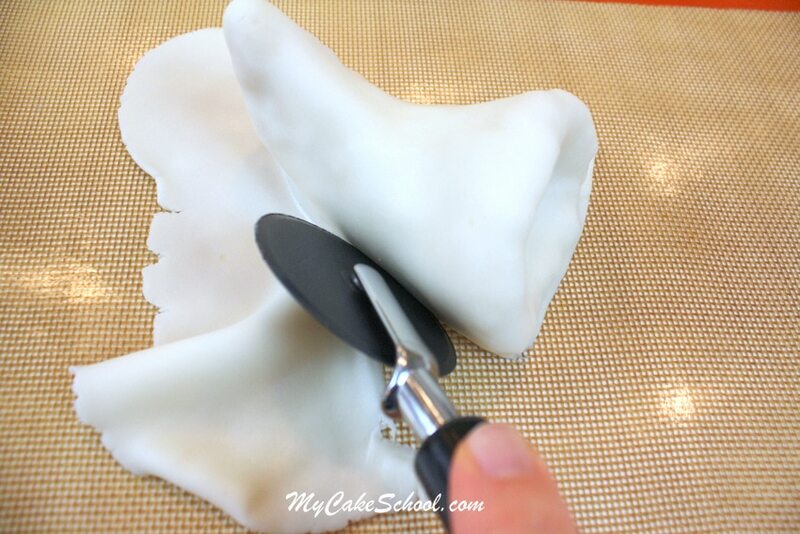 How do you attach ribbon to the bottom of the cake? @Gracie– I lightly greased the ribbon with vegetable shortening and wrapped it around the cake. 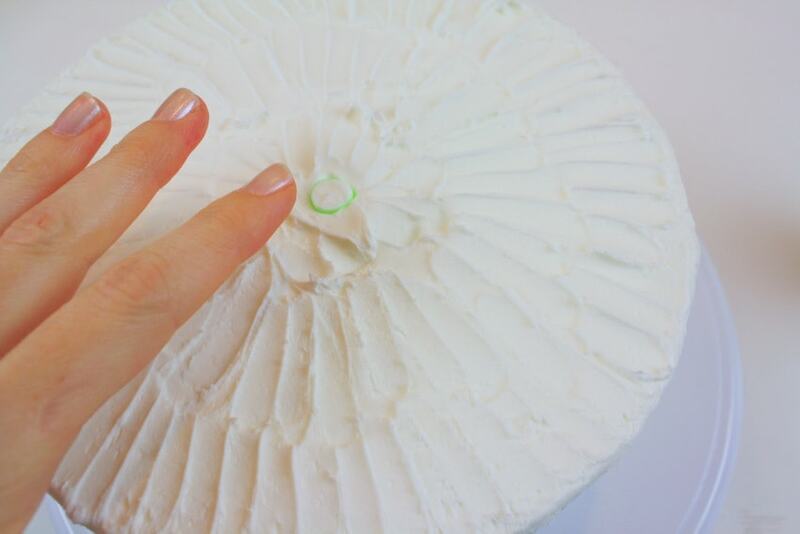 This is what I like to do whenever using ribbon so that there is no splotchiness from the frosting (everything is evenly “discolored”). 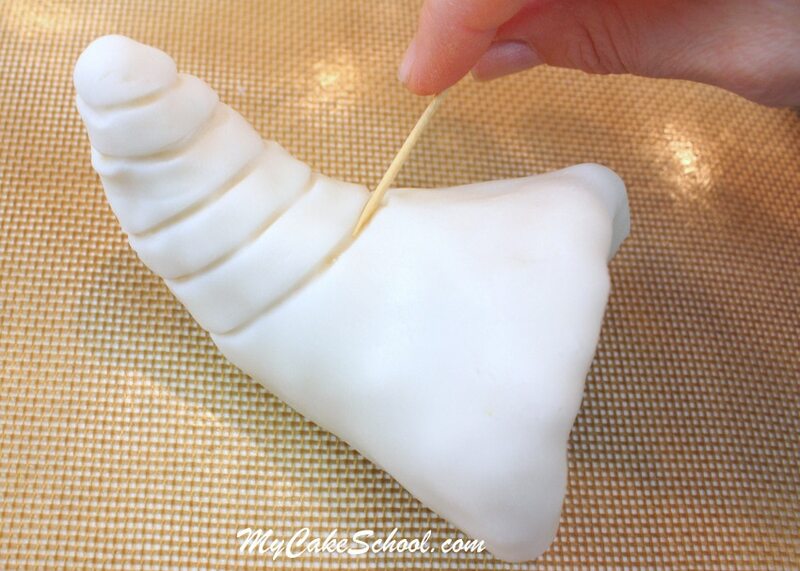 I let the two ends slightly overlap in back and glue together with a dot of buttercream.